Today we’re happy to announce our new Revenue Retention Analytics that provide visibility into the performance and effectiveness of your efforts. Equipped with these insights, you can continue to fine-tune your strategies and monitor results for maximum revenue recovery. You can access the new Revenue Retention Analytics from the Analytics tab of your Chargify Site. A quick note before show and tell: These analytics are still new, so if you if you have feedback or feel like any numbers are off, please let us know. Newly In Dunning is the revenue at risk due to customers who entered the dunning process. Lost Revenue is the unrecovered revenue for the selected time period. Recovered Revenue is the at risk revenue that was successfully recovered. 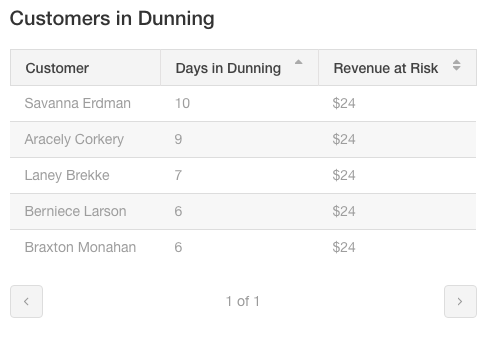 The Dunning Efficiency table allows you to see, at a quick glance, where the majority of your revenue is being recovered (visually represented via the darker colors on the table). Ideally, your own Dunning Efficiency table would show dark green in the 0-3 Days or 4-7 Days columns, indicating the majority of your at risk revenue is being recovered quickly. You can click on any of the numbers in the table to see the customers that make up each of those numbers. 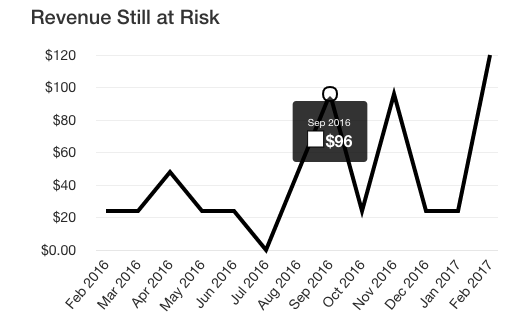 This graph allows you to quickly view historical data and see what your company’s “revenue still at risk” was at the end of each month (or the time period you specify). The Customers in Dunning table allows you to see a complete list of customers currently in dunning. You can also click on any customer’s name in the table and be taken directly to their subscription page in Chargify. This is a great way to find accounts that may warrant a more personal touch to prevent churn (and an awesome resource for your customer success team!). 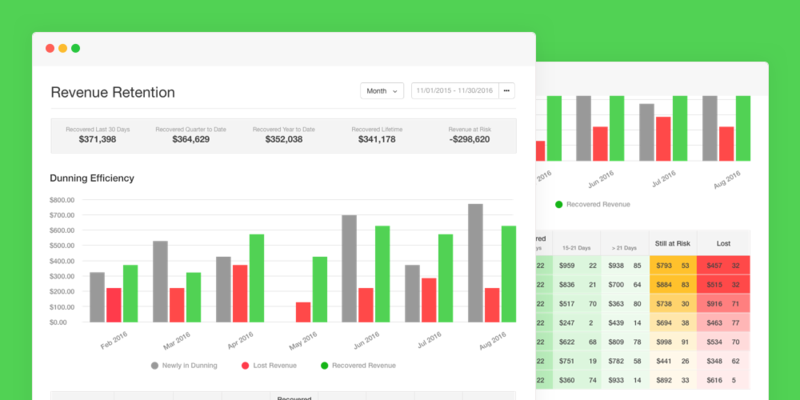 We’re proud to offer all Chargify plans easy-to-configure revenue retention tools and we’re excited to release reporting which provides you a clear view of the performance of those revenue retention efforts. If you have feedback or questions related to these new reports, please don’t hesitate to email support@chargify.com — we’re here to help!